Bridgewalker is a euro-denominated wallet for the Bitcoin economy. 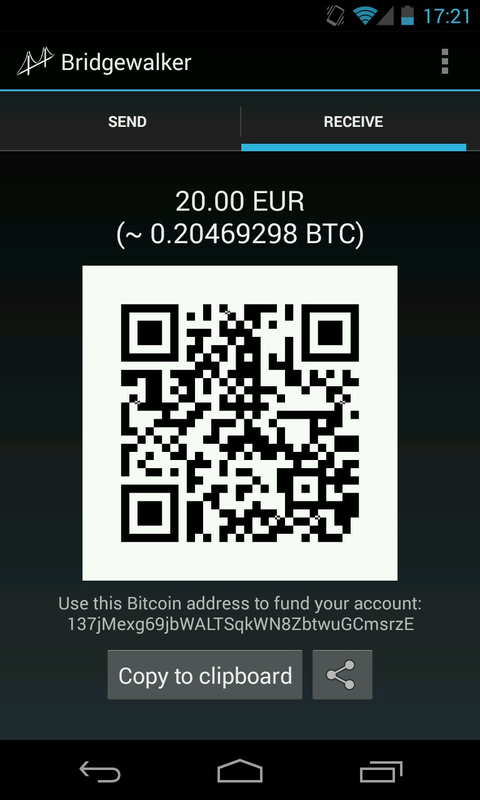 Send and receive bitcoins, but maintain your balance in euros. Bridgewalker converts back and forth between the currencies just when you need to send bitcoins or receive them. Bitcoin's strength is fast and cheap world-wide money transfer with zero risk of identity theft. Use Bitcoin as a digital payment mechanism, without worrying about its exchange rate! 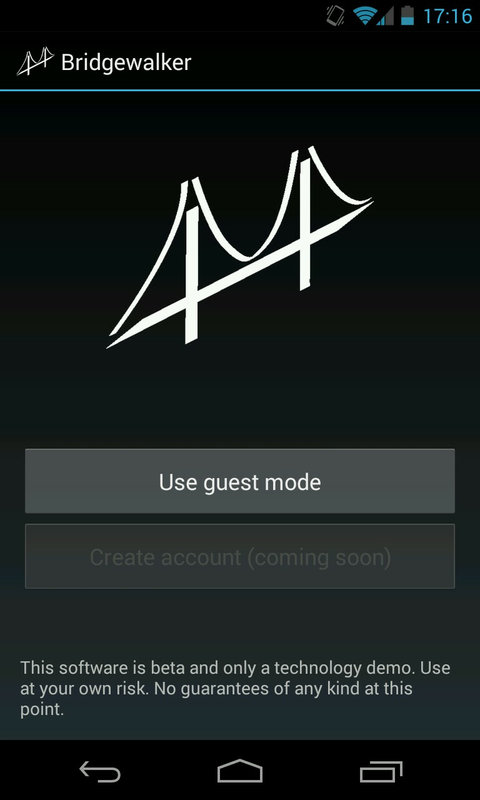 Both the Bridgewalker server as well as the Android client are open source. Fees for this service are 0.75 % on each deposit and withdrawal (i.e. 1.5 % for a "round trip"), but will go down in the future as volume increases. Transactions between Bridgewalker users are free and instantaneous. Please note: This software is beta and only a technology demo. Use at your own risk. No guarantees of any kind at this point. Use guest mode to create a new account with a single click. A random user name and associated secure password will be generated for you in the background and stored on your device. Full accounts are coming soon, with more functionality, such as setting an extra PIN for additional security and being able to create backups. Given the current limits of guest accounts (which offer only rudimentary backup functionality) and beta state of the software, please keep only small amounts in your account. Switch to the tab "Receive" to see the Bitcoin address of your account, both in text form as well as a scannable QR code. Transactions to this address will require a number of confirmations - typically three - after which they will be exchanged for euros at the current market price and credited to your account. 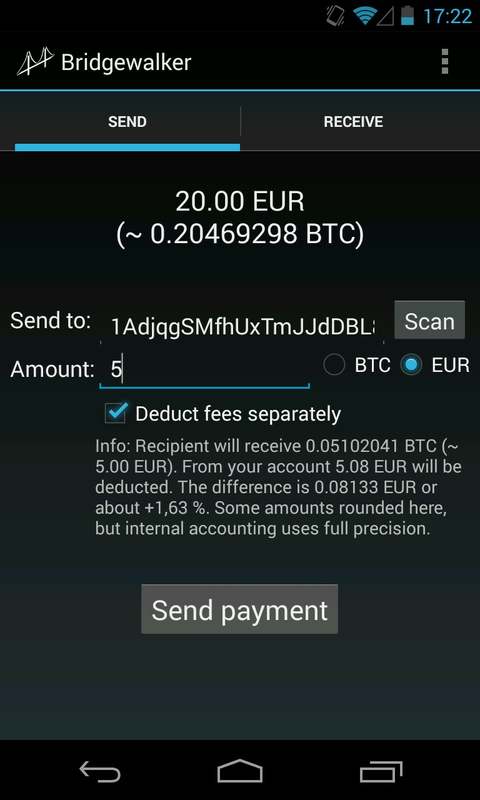 Use the tab "Send" to make a Bitcoin payment. 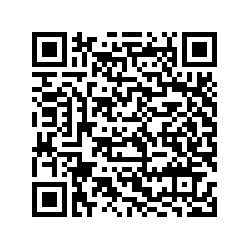 Either enter the recipient's Bitcoin address manually, scan it from a QR code or receive it via NFC. When entering the amount, you can choose between specifying it in bitcoins or in euros and Bridgewalker will do the currency conversion for you. When giving a euro amount, the recipient will receive bitcoins roughly equivalent to this amount. Because of fees, slightly more will be deducted from your account. If instead you would like to have no more than the specified amount deducted from your account, change this behavior by unchecking the option "Deduct fees separately". Bridgewalker currently has a "round trip" fee of about 1.5 %, depending on current market conditions. 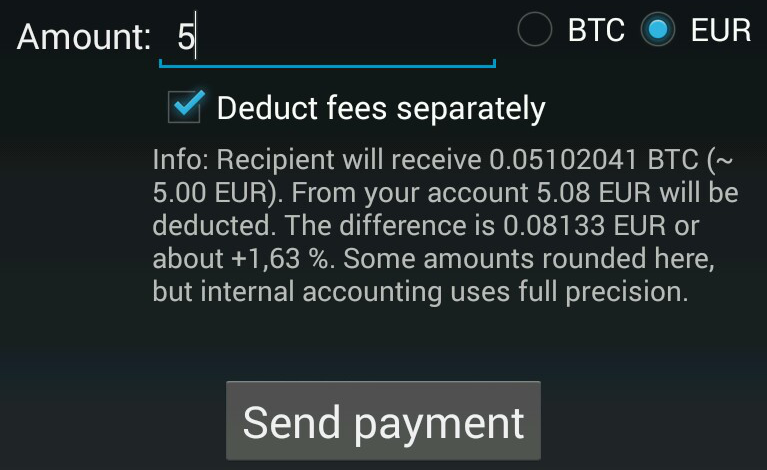 That means, if a friend sends you 1 BTC and you send it back to her right away, she is left with 0.985 BTC. This does not only include the exchange fees Bridgewalker has to pay to its partnering Bitcoin exchange, but is also influenced by the current market spread (difference between highest bid and lowest ask). As Bridgewalker's volume increases and Bitcoin markets become more efficient in general, these fees should go down. The value of a given BTC transaction in terms of current market bids (i.e. 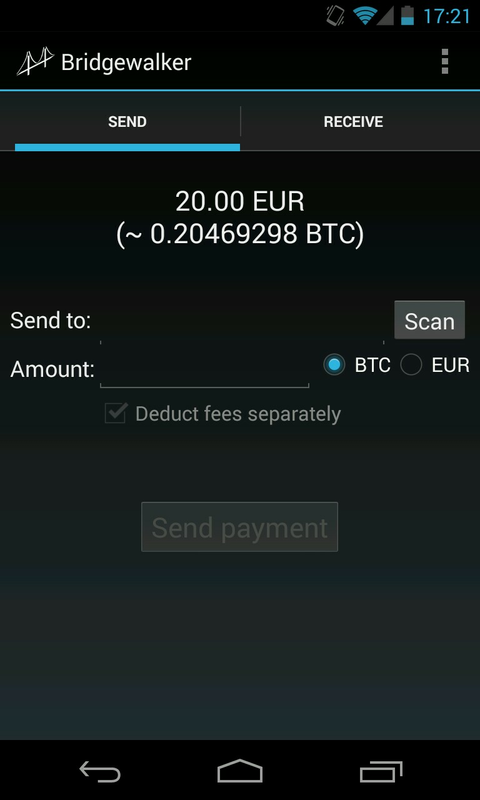 "how much EUR would the recipient earn from selling this amount of BTC given the current order book"; possible exchange fees paid by the recipient not taken into account). The cost to you of acquiring the given BTC amount by filling current market asks and paying exchange fees in the process. These two values are displayed as the recipient's side and your account side, respectively, in the info text above the "Send payment" button. A percentage difference between them is calculated, to give you an idea of the overhead introduced by the currency conversion (exchange fees and market spread). Q: Who is behind Bridgewalker? My name is Jan Vornberger. I run Bitcoin Monitor and was the original creator of Instawallet before giving it over to Paymium. I post on the Bitcoin Forum as user jav. Bitcoin is both a payment mechanism and a currency. The payment mechanism works today: It offers fast, cheap, world-wide digital payments without the problems of identity theft, as it is cash-like and pseudo-anonymous. It is also the first digital payment system without middlemen and therefore is a good candidate for being adopted as a neutral protocol, free of gatekeepers. Bitcoin the currency, on the other hand, is still very much an experiment. Being a young currency, it experiences high volatility and economists argue about its long-term viability to be used as the sole currency of an economy. To continue this experiment, I believe it is necessary to develop solutions that are usable today and especially address the market volatility. On the merchant side, services like BitPay and Coinbase offer protection from exchange rate risk. Bridgewalker is the counterpart for customers, offering euro-denominated accounts with easy access to the Bitcoin network. The combination of these tools allows the use of Bitcoin as a payment mechanism, without being affected by exchange rate swings. Increased use of Bitcoin will hopefully help to stabilize it over time, so that maybe some day these crutches will no longer be necessary. Q: How secure is Bridgewalker? Security is a core priority in the design of the Bridgewalker software stack and the server component is written in Haskell, which is very helpful in building robust and secure systems. The production servers are configured to have a very small attack surface and two-factor authentication is utilized in several places. All communication between client and server is encrypted and the client generates a strong, random password for its account. I can point to my track record with Instawallet, which had no security incident during the time I ran it (from launch in April 2011 until March 2012), although admittedly Paymium had less luck later on. That said, Bridgewalker is currently in beta, so proceed with caution. Q: Are you taking a gamble on Bitcoin's exchange rate? No, I do not take on any exchange rate risk! I maintain Bitcoin short positions equivalent to the total amount of bitcoins deposited. Therefore everything is fully hedged. Q: What are green addresses? Green addresses are a convention by which a sender uses one of his addresses in every one of his transactions, thereby signaling the origin of the transaction to a recipient who recognizes the address. If the recipient trusts this specific sender to not attempt to double spend, the recipient may treat the funds as confirmed the moment they arrive. See the wiki page for more details. Bridgewalker has support for green addresses in theory, although currently (December 2013) no specific addresses are configured. Previously Mt.Gox Bitcoin transactions were recognized in this manner, but Mt.Gox discontinued its support for green addresses. All outgoing Bridgewalker transactions can be recognized by the green address 1MAxx46Dp3tFw933PxPwEYYGCpxYda2pyH. Q: Is Bridgewalker compatible with SatoshiDice? No, it is not. Because Bridgewalker uses a shared wallet, any winnings that are sent back to Bridgewalker can not be attributed to your account. You will need to use a different wallet, if you intend to gamble on SatoshiDice. Q: Is the APK available outside of Google Play? Yes, you can download a copy here. Q: Will there be a version of Bridgewalker for iOS? I would like to support iOS, but it seems a little unclear to me at the moment, whether such an app would be allowed in the App Store. I am reluctant to invest the effort to create such an app, if there is a considerable risk that it will not be approved. Things like Cydia do not seem like much of a solution to me, as only a small percentage of people actually jailbreak their device, from what I can gather. Q: Will there be a desktop version of Bridgewalker? Most likely at some point, although it is not a priority at the moment. The current Android client talks to the server over a websocket connection, so either an HTML5 client or some type of desktop client would also be possible instead. Bridgewalker is open source and the server API is documented - feel free to have a go at it, a third-party desktop client would be very welcome! Read more about Bridgewalker on its blog. Please note: Bridgewalker is no longer operational. This website remains online for posterity's sake. See the shutdown blog post for more details.